There are times when the word “solid” is the most appropriate to describe a film. The Post fits this description perfectly. It has a great cast, a decent and in some cases “worthy” story and a director that ties the events together perfectly. The issue is that solid doesn’t necessarily equal great and The Post lacks enough to push it into classic territory. This seems strange considering the trio at the centre of the movie. Tom Hanks, Meryl Streep and director Steven Spielberg should equal huge success. It should be a powerful drama with stand-out performances that should at least bother the Academy and be close to winning a bundle of Oscars. It never really reaches that level though. Hanks and Streep are great but hardly put-in a career best performance while Spielberg directs a drama in a direct manner, showing little ambition. Not that The Post necessarily needs directorial tricks. It could be because there are weaknesses with the story itself. 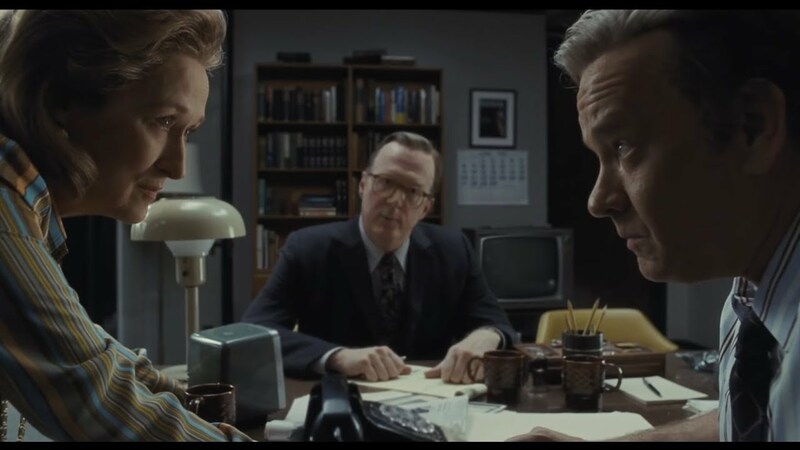 The Post is a worthy tale and a true story which showcases the importance of media independence from the Government. This is done through the medium of the Pentagon Papers and the scandal and controversy that surrounded the publishing of those documents. So far, fairly interesting but the build-up to the principle decisions feels so dry. It is never fully engaging because you never feel the characters are at risk. The titular paper in question is standing on the sidelines for at least the first act and never becomes truly involved in other interesting aspects of the story, for example the fact that The Post was the only female owned newspaper. That isn’t to say the story never kicks into a higher gear though. Once The Post gets their hands on the Pentagon Papers, the movie becomes one of moral, political and ethical dilemmas. That clash between Government and free press makes for a tension filled, frantic evening of typing, phone calls and career ending decisions. Here is where the movie seems to embrace the killer ingredients it has and Hanks, Streep and even Spielberg find their feet. It is too little a part of the bigger picture though and as quickly and as engaging as it is, this strand of the story ends and we get an almost teaser elements to end the movie which is subsequently picked up in All the Presidents Men. Overall, The Post has plenty of strong aspects but never truly capitalises on the talent it has at it’s disposal. The story is worthy but struggles to really engage and although it does have a spark of like in the last stages, it isn’t enough to truly push this beyond a “solid” movie.